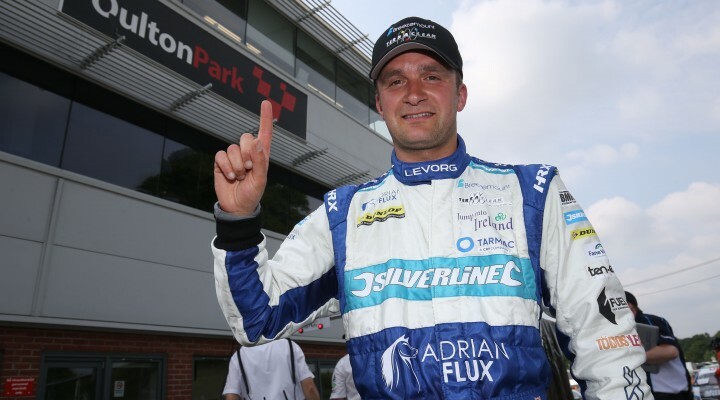 Colin Turkington has scored Silverline Subaru BMR Racing’s first pole position in the Dunlop MSA British Touring Car Championship after the Ulsterman set a stunning pace at Oulton Park. An exciting session at the 2.26-mile Cheshire track commenced with Turkington and team-mate Jason Plato initially holding a one-two for the Japanese marque. The fightback came from a whole host of challengers, however, which saw Plato demoted down the order by the likes of Gordon Shedden’s Honda and Ashley Sutton’s MG. Most of the field pitted shortly after the midway stage of the 30 minute session – as is relatively normal procedure in the BTCC – in preparation for a final flying run on fresh Dunlop rubber. Sam Tordoff was up to second as the session neared its end in his Team JCT600 with GardX BMW, before rookie Daniel Lloyd amazingly pipped him in the Eurotech Honda. Challengers came and went, and despite the incredibly close gaps throughout the top ten, nobody could dislodge double BTCC champion Turkington from top spot. The result represents a huge upturn in fortunes for the manufacturer-backed Subaru squad – impressively bouncing back from a disappointing weekend at Thruxton last time out. Recurring fuel system issues – first experienced at Donington Park – forced the team to make the difficult decision to withdraw from action on safety grounds from last month’s meeting in Hampshire, but new components, engine modifications and a two-day test have seemingly had the desired effect on the all-new Levorg model here at Oulton Park. Lloyd took a brilliant second in qualifying, just 0.019 seconds shy of pole-sitter Turkington, providing Eurotech Racing with its first front row spot since Thruxton in 2014. Tordoff took third ahead of the earlier pace-setting Toyota of Tom Ingram, while reigning champion Shedden had to settle for fifth – though just 0.001 seconds behind Ingram’s Speedworks machine. The extraordinarily close session saw the top five separated by less than a tenth, with less than a second covering the top 22 cars. Plato’s Subaru had nipped back past Sutton’s MG on the final run with the two coming home in sixth and seventh respectively, whilst the ballast-laden Honda Civic Type R of Matt Neal was a credible eighth. Aron Smith and Josh Cook rounded out the top ten. A number of usual front-runners endured challenging sessions, including the two BMWs of Jack Goff and joint series leader Rob Collard that had to make do with 15th and 16th respectively. Motorbase Performance also had a tough time with Andrew Jordan taking 12th and Mat Jackson down in 25th. Arguably the most surprising performance in qualifying came from WIX Racing’s Adam Morgan, who ended up way down in 28th position. Morgan claimed a podium hat-rick at Thruxton last month – scoring more points than any other driver – but he’ll be looking to forget a dismal day here, citing balance issues in his Mercedes A-Class. Rounds 10, 11 and 12 of the 2016 Dunlop MSA British Touring Car Championship are being screened live and exclusively on ITV4 from 11:15am tomorrow.